Production: Bavaria Atelier, Radiant Film; Fuji colour, 35mm; running time: 149 minutes. Originally a television miniseries shown in 5 parts; shortened version released theatrically. Producer: Günter Rohrbach; co-producer: Michael Bittins; screenplay: Wolfgang Petersen, from the novel by Lothar-Günther Buchheim; photography: Jost Vacano; editor: Hannes Nikel; assistant directors: George Borgel, Maria-Antoinette Petersen; production design: Rolf Zehetbauer; art director: Gøtz Weidner; music: Klaus Doldinger; sound editing: Mike Le Mare, Eva Claudius, Illo Endrulat; sound recording: Milan Bor, Trevor Pyke, Werner Bohm, Heinz Schurer, Karsten Ullrich, Stanislav Litera, Albrecht von Bethmann; costumes: Monika Bauert. Claude-Olivier Rudolph ( Ario ); Jan Fedder ( Pilgrim ); Ralph Richter ( Frenssen ); Joachim Bernhard ( Preacher ); Oliver Stritzel ( Schwalle ). Buccheim, Lothar-Günther, Der Film—Das Boot—Ein Journal , Munich, 1981. New York , 15 February 1982. Ciompi, Valeria, "El último submarino," in Casablanca , no. 13, January 1982. Grelier, R., Image et Son (Paris), March 1982. Lardeau, Y., "La Qualité allemande," in Cahiers du Cinéma (Paris), March 1982. Gartenberg, J., Films in Review (New York), April 1982. Combs, R., Monthly Film Bulletin (London), May 1982. Spratt, M., Films and Filming (London), May 1982. Girard, M., Séquences (Montreal), July 1982. American Cinematographer (New York), December 1982. Grab, Norbert, "In the Line of Light: Der Fernseh-un Filmregisseur Wolfgang Petersen," in EPD Film (Frankfurt-am-Main), vol. 13, no. 6, June 1996. Oppenheimer, J., "Salvaging Das Boot ," in American Cinematographer (Hollywood), vol. 78, May 1997. Das Boot is a landmark in German cinema: it is the most expensive (at $2 million) and the most popular (at home and abroad) German film ever made; it was nominated for five Academy Awards; it has proven the most successful foreign-language film release in the United States; and it has managed to capture a certain heroism for a most unheroic period in German history. 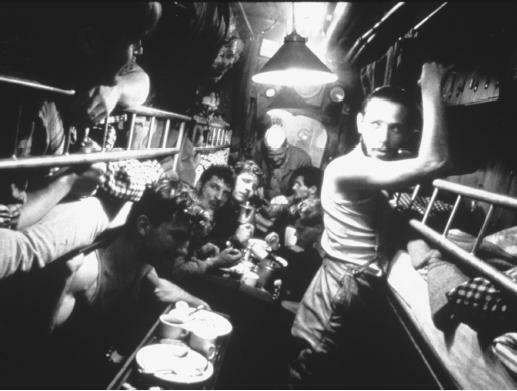 The film closely follows a novel of the same title by Lothar-Günther Buchheim, a submariner on a U-Boat in World War II who wrote the novel more than 30 years later (1973), metamorphosizing grim and unsung war time experience into much-praised artistic prose and heroic action sequences. A shift in perspective changes our view of the sailors themselves, from sneak-attack killers in the despised service of a beaten dictatorship to a heroic brotherhood itself victimized by Nazis. The film begins with the stark announcement that 30,000 of the 40,000 German submariners in World War II failed to return home. Rather than the shadowy wolf-pack preying on unarmed civilian freighters, the sailors become victims themselves, cogs in a war machine, who retain an admirable humanity in spite of hopeless circumstances. The film thus announces that it is time to see an important element of the German wartime experience through new eyes. This revisionism is accomplished, ironically, by revitalizing and humanizing the clichéd post-war Nuremberg defence, "I was just following orders." The crew of Unterseeboot-96 are doing just that, facing near certain death with a stalwart humanity that refutes their Allied reputation as killers and attempts to repudiate their connection with Nazism. The creation of sympathy begins early, with an extended opening sequence in a brothel. One of the few scenes set on shore, the pre-mission officers' celebration begins with some decorum but quickly descends into revolting decadence, including officers passed out in vomit in a filthy men's room and taking drunken pistol shots into the ceiling. Jürgen Prochnow (the 30-year-old captain, "Die Alte" or "Old Man" to his men) looks on with war-wise sympathy, noting his men's fear and innocence as the British learn to sink U-boats. Prochnow's fellow captain and friend, Thomsen, mocks Hitler's leadership in a speech that temporarily quiets the room, drawing glares from the few Nazi sympathizers in attendance. The message is clear: the private selves of these submariners are racked by despair over their hopeless prospects, prospects created by an incompetent, increasingly intrusive, and completely uncaring leadership. These are truly good Germans, unlike the self-convinced, righteous robots of the new generation of Nazis. Once set up, this message is continually repeated. Prochnow's "speech" to his men before shipping out is vintage Gary Cooper: "Well men—all set? Harbour stations!" The taciturn captain has no patience with the grandiloquent rhetoric of Nazi romanticizers of war, and runs a ship that is egalitarian and almost completely lacking in military ceremony. Though uncompromising about the need for competence and procedure in reports and duties, the captain is contemptuous of his spit-and-polish Nazi First Officer, who persists in wearing a uniform rather than the worn sweaters favoured by the other officers. Prochnow is filmed unshaven and then in dishevelled beard, asleep, slumped over controls. The ship itself is similarly domesticated, made gemütlich by strings of sausages hanging from the overhead pipes, loaves of bread cluttering the controls, and crates of lettuce in the torpedo room. A comic scene shows Prochnow's flexibility in the face of mortal danger and Nazi humourlessness: he leads a full-crew sing-along of "It's a Long Way to Tipperary," the British marching song, in English—an ironic challenge to his enemies, foreign and domestic. Throughout, the film, the wolf-pack image of the U-boat crew is tamed through sympathetic touches. Some of the sailors are pathetically young; one has a pregnant French girlfriend who will suffer retribution alone since his daily letters are impossible to mail. The ultimate leaders of the enterprise are systematically undercut: as when a fly crawls over a shipboard photograph of a German admiral. After weeks at sea, the U-96 finally sinks some ships in a convoy, only to surface and see drowning British sailors, a close encounter with a suffering enemy which fills the conning tower crew with horror. When given an absurd order to pass through the enemy-held Straits of Gibraltar, the captain tries to put the First Officer and the journalist ashore, only to encounter arrogant and smug Nazi sympathizers— men totally insensitive to the frightening experiences of the submariners. The captain shares the terrors of depth charge attacks and a likely prolonged death by suffocation that outsiders don't understand and don't care to. The grimness of shipboard conditions, the nearness of death, the existential pushing on under hopeless prospects are universals that bridge nationalistic differences. The sympathetic power of Das Boot and the exhilaration of its chase scenes are so great that it is easy to forget that such submariners systematically sent scores of unarmed freighters to the bottom of the sea, condemning helpless civilians to death by drowning, hypothermia, or worse: the aptly-named wolf-packs pulled down the slow, the crippled, the unwary, in acts that had more in common with execution than with warfare. Das Boot shows us a later period when the war was going badly for the service and Allied technology made what had previously been easy slaughter a fair fight. We see the U-boats made vulnerable, and the "cruelty and magnificence" that had initially intoxicated the journalist observer, Lt. Werner (author Buchheim), replaced by the grim reality of defeat. The film is a splendid revision of the record to highlight an undeniable historical fact: the submariners were also victims in this period, and deserve respect for clinging to what decencies and humanity were left to them. The film is honest on this point, and though it loses the aesthetic brilliance of the novel's prose—it would take cinematography of unparalleled virtuosity to capture it, a task impossible with model submarines in a studio tank—it effectively captures the texture of life in extremis , the true brotherhood sustained by a common front against despair and terror, and the unutterable sadness of war.